Introduction to polymeric scaffolds for tissue engineering; Introduction to polymeric drug delivery systems; Hydrogels in cell encapsulation and tissue engineering; Biodegradable polymers for drug delivery systems; Polymers as replacement materials for heart valves and arteries; Ultra-High Molecular Weight Polyethylene (UHMWPE) in joint replacement; Polymers in biosensors; Tissue engineering using natural polymers. Given the rapid development and use of biomaterials, it is becoming increasingly important to understand the structure, processing and properties of biomedical polymers and their medical applications. With its distinguished editor and team of international contributors, Biomedical Polymers reviews the latest research on this important group of biomaterials. The book discusses natural, synthetic, biodegradable and non bio-degradable polymers and their applications. Chapters review polymeric scaffolds for tissue engineering and drug delivery systems, the use of polymers in cell encapsulation, their role as replacement materials for heart valves and arteries, and their applications in joint replacement. The book also discusses the use of polymers in biosensor applications. Mike Jenkins is a Senior Lecturer in the School of Engineering at the University of Birmingham, UK. 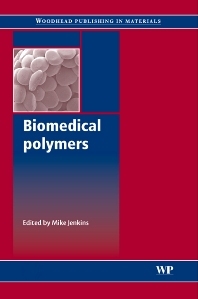 Dr Jenkins has published widely in the field of polymers.